Siemens has signed an MoU with GECOL to resume maintenance and complete work on various power stations (Photo: GECOL). 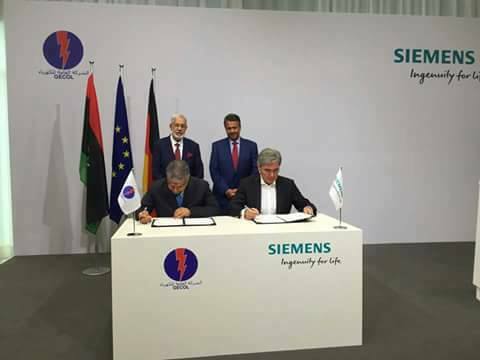 The state-owned General Electricity Company of Libya (GECOL) and German energy giant Siemens signed an MoU last Saturday in Germany that would pave the way for the return of the German company to Libya to complete its many outstanding projects. These include the completion of the Ubari power plant in southern Libya, which is reported to be over 90 percent complete, as well as providing urgently needed maintenance to a number of other power plants. Well-placed sources told Libya Herald that Siemens has been able to ‘‘establish a close relationship between the German and Libyan governments’’. The recent meeting in Germany ‘‘focused on how Siemens supports GECOL in achieving stability of generation transmission’’. The agreement signed ‘‘covers GECOL priorities and support that Siemens will provide especially with regards to fast-tracking the projects and giving high priorities to the service needs’’. The sources said that Siemens engineers had already performed ‘‘several visits to (power plants at) Sarir, Benghazi and Misrata to bring existing units back to full capacity on to the grid prior to the signature of this agreement’’. The Ubari plant is also ‘‘clarified and in the final phase of commissioning soon’’. Asked if there were any possible sticking points to the implementation of the agreement, the sources said that there were none ‘‘except funding which is being clarified between GECOL and the Central Bank (of Libya)’’. It is not clear if this agreement will indeed lead to increased power generation and hence a reduction of power cuts across Libya. The Faiez Serraj-led Presidency Council/Government of National Accord had promised that power cuts would be reduced this year. However, as temperatures have risen this summer, acute power cuts – including some total blackouts have already hit the country. The main obstacles to foreign technicians from all companies have been security and payment. Some companies used to working in high risk zones have indicated that they can mitigate some security risks, which leaves the issue of payment of outstanding monies. The collapse in world crude oil prices and the fall in Libya’s oil production has reduced the Libyan state’s revenues. Libya is operating on a recurring annual budget deficit and its annual revenues fail to cover even state-sector salaries. It is surviving by dipping into fast diminishing foreign currency reserves. However, fighting around the main oilfields has stopped and the National Oil Corporation has succeeded in increasing oil production in 2017 to above the one million barrels per day mark. This should give the Libyan authorities some leeway if they decide to prioritise power generation by diverting much need scarce foreign currency to foreign electricity contractors.